So, I’ve proven myself to be brilliant by donating three puffy coats from my UK days to a coat drive… just before temps plunged into the twenties here. BOY, am I feeling smart. In the other category of Brilliant – and I mean SERIOUS, real brilliance – is the tumblr site, People of Color in European Art History. Two recent posts from POC’s tumblr are about what gets left out in art history books. Most of what we saw in Survey of Art was excerpted… and, until I went to the Rijksmuseum in Amsterdam to see the grand old Rembrandt, Night Watch, in person…? I didn’t know that. Well, sometimes MORE than background gets excerpted… in a bizarre kind of sideways whitewashing. For instance, there are portraits of our first president… sans the staff and slaves and servants standing next to him, who are of African descent. I suspect that’s to make him look less like a loser slave-owner, but come on. The father of our country was, a., a great man, and b., a slave owner, not necessarily in that order, either. Accuracy in history is important, for more reasons than just accuracy. As you might expect, the person uploading these images is having SEVERE backlash from closet-and-not-so-closeted people whose racist baseline beliefs are being shaken. Though she is just scanning pictures she’s found from books and digital library/academic journal sites that the average person is unable to access, she’s catching a lot of flack. A TON of flack. But, she’s responding with grace — and with double-barrels of history, which in this case is the best defense. In more brilliant news, thanks to Kelly Jensen from STACKED blog who moonlights at Book Riot, I’m on a flowchart! Or, MARE’S WAR is, anyway. Thanks for the shout out, Book Riot! A brilliant Jama celebrates an adorably demented eleven-year-old on the publication of his first book, a SFF epic called THE ADVENTURES OF TOMATO AND PEA. It is about aliens who crash land on EAR-TH. He puns, he writes, and the boy can COOK, too. In more BRILLIANT news, one of my favorite naturalist/environmentalist/artists, Rosemary Mosco, has suggestions for Christmas trees. I’d love this artist to make holiday cards; she makes science comics instead, and that’s more than okay, too. Do poke around her site – some fun stuff. Daddy, artist, mathematician and pancake artist (?) Nathan Shield has already shown himself to be seriously brilliant, what with his Liver Fluke and Hobbit pancakes. (No, not at the same time. Pay attention.) Now that he’s gone through book characters and disease vectors, he’s doing… Fractals. No, seriously. Check it out. Aaaaand in the category of Somewhat Less Than Brilliant: have you heard that there are world-eating octopi out there? No? Well Now You Know. There are. The Office for the Director of National Intelligence, which is a kind of umbrella organization over groups like the NSA, is being really serious about the fact that our country has SUPER good intelligence. So much so that this is their new logo and tagline… for serious. As in, not a joke. Especially ironic because international papers revealed this week that the NSA has been spying on online gamers. Apparently, there was a need for undercover … orcs. On one hand, that made me laugh at first, but then, I got depressed. The War of the Worlds/Cthulu/Bond movie ties are not amusing. Others don’t find it amusing as well. Scottish author Charles Stross blogged this week that he’s going to hit a pause on writing near-future stuff, … because the NSA keeps stealing his plots. No, seriously: his stuff is starting to be predictive. Which is scary. I feel his pain a tiny bit, because almost three years ago, I was working hard on a space opera/sci-fi novel and used a planet that would work to support human life… you may have heard of it… Glise? Yeah. Just as I’d written an entire deep space station, school, students and drama, I was hit with reality. I know, I know. There are something like forty billion planets that are vaguely Earth-like, but I’d done all this research and supposition about how the settlers would arrive, their path from Earth, the tech which would make this possible (not FTL drives, just fyi), and I was faced with starting again — and feeling oddly exposed, like the universe was reading my drafts… so, that one is sitting on a To Be Rewritten pile, and we’ll see what happens. For some reason, this weather makes me long for instant camping foods that can be eaten, hot, with a just-add-water motif. Hot chocolate, ramen, soups… Totally nasty, most of the time, as well as bad for me, but maybe it’s because it’s camping temps in my frigid cold office? Ah, well. Still must work, and still must find more gems and lights in this season of wonder. Cheers for now. Thanks for all the nice links and stuff even though the octopus makes me sads. I hope you saved yourself something warmish! 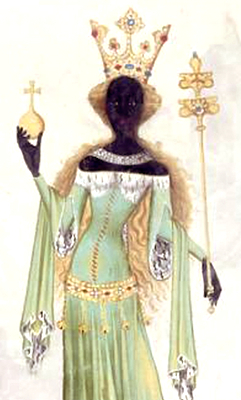 Pretty cool about the People of Color in European Art History blog.